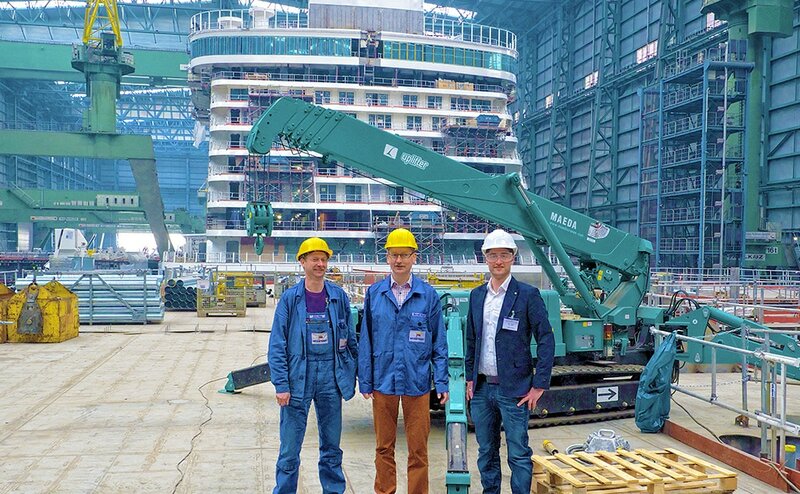 The company Meyer Werft of Papenburg relies on the MAEDA mini cranes on Uplifter GmbH & Co. KG for many years. They are used to relieve the large gantry cranes, as well as in the assembly of elevator rails and glass assembly. Until the introduction of mini cranes large cranes were completed the time-consuming, labor-intensive and expensive work. Other important crane work had to wait so. Through the purchase of new cranes MAEDA cost capacity has been created. Due to the ease of use of external service employees could be trained quickly so that they own without shipbuilding staff could work on their own. The engineers realized very soon the many possibilities of uses this type of cranes has to offer. This large number of applications the machines are often used and are always busy. Nowadays these cranes are also used for the completion of conservatories and climbing park on the ships. 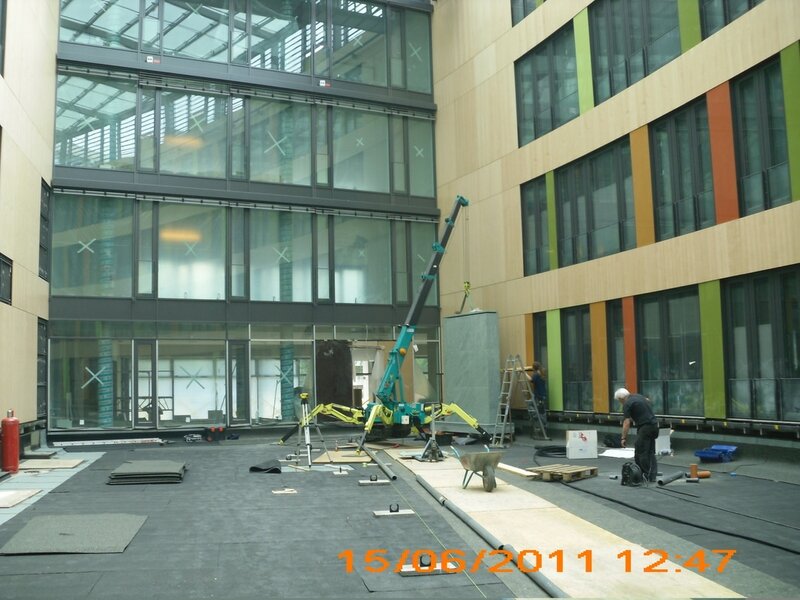 To order a mobile crane for the transport of goods outside the production hall belong to the past. Because the mini cranes take care of everything. Another area with enormous potential for savings. All of these advantages made the decision easy for the acquisition of another mini crane. Preston Hire’s first experience with Maeda mini cranes came about when we required a small crane to shift structural steel on a very tight work site in Sydney early in 2006. It was difficult to find one to suit until we spoke to Paul Heeks, the owner of Pace Cranes, Maeda’s Australian distributor, and he supplied a Maeda MC354 mini crawler crane. We had it on site for some time and it was an excellent machine for the job. Seeing an obvious need for mini crane hire in the market and liking the quality of the Maeda product, we then spoke further with Pace Cranes and purchased our first Maeda MC354 for NSW in mid-2006, followed in quick succession by an MC355 and two MC285Cs. 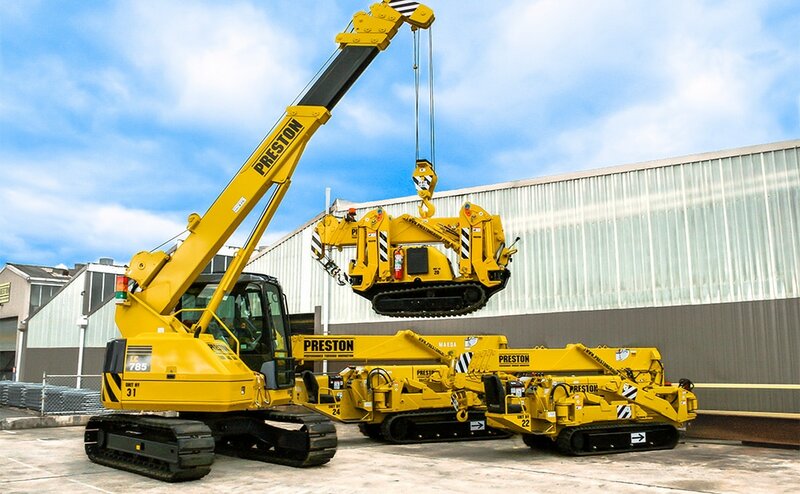 We now have over 50 Maeda mini crawler cranes in our fleet, making Preston Hire the owners of the largest Maeda mini crawler crane fleet in Australia and the fifth largest owner of Maeda mini cranes in the world. Maeda mini cranes are definitely our cranes of choice due to their excellent build quality and reliability and also the outstanding support we receive from Pace Cranes and Maeda; our three companies all share a strong culture of service and support which has resulted in very productive business relationships. Over the years we have purchased numerous cranes from other manufacturers but to this point we have always found Maeda cranes to be the more reliable and best value for money. Georgia Aquarium in Atlanta, Georgia is North America’s largest aquarium at over 600,000 square feet. Despite its massive size, a recent remodel of the facility benefited greatly from an MC405C Maeda Mini-Crane. Limited access required general contractor Brasfield & Gorrie, headquartered in Birmingham, Alabama, to devise a way to remove large structural components in order to build out a new sea lion display. “We thought of using a carry deck crane first, but they are really meant to work on level ground which we do not have in this work area,” explains Todd Hamby, project superintendent. 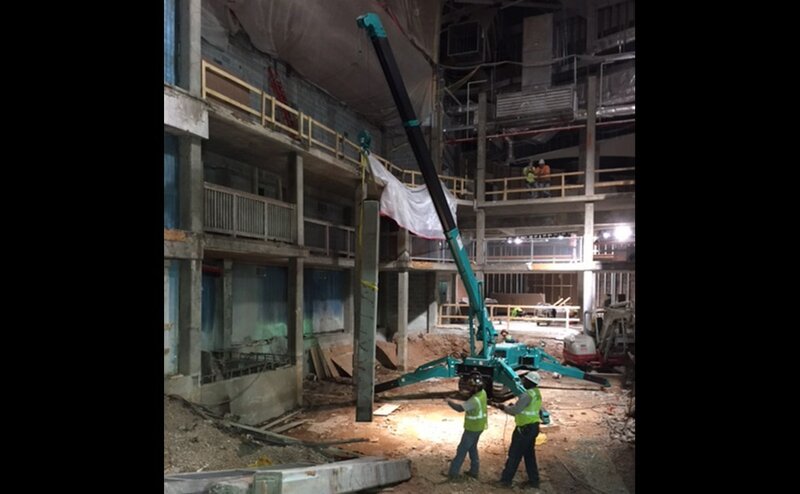 Instead the company chose a Maeda MC405CRME mini-crane with its 67’10” maximum lift height and 8,480 pound maximum capacity rented from ML Cranes & Equipment of Charlotte, North Carolina, a Maeda distributor for Maeda USA in Houston, Texas. Most importantly, the track-mounted MC405C has a 54 inch width and an outrigger spread that fits in a 20 foot square area. “Initially we thought of cutting a hole in a wall for crane access, but the Maeda crawled right into the freight elevator and powered itself into position,” Hamby explains. The MC405CRME with its dual power capability allowed for moving the crane into position with the diesel engine, but working and lifting while operating on electric power for the indoor work without exhaust issues. Brasfield & Gorrie were the original constructors of Georgia Aquarium in 2005. The company was recently named 2015 Contractor of the Year by the Associated Builders and Contractors. CONEXPO-CON/AGG is North America’s largest construction trade show representing asphalt, aggregates, concrete, earthmoving, lifting, mining, utilities and more. We are proud to exhibit a little range of our Minicranes at CONEXPO 2017. Experts say, this show is massive and everyone in this branch should attend it. There all the latest equipment is presented. Cutting-edge technologies are introduced. This show helps to make our industry even more efficient. Come and join us with our mini cranes! We are looking forward seeing you there! We will be exhibiting a range of Maeda Mini Cranes at CONEXPO 2017. Following models will be exhibited with various options. Die Ärztekammer Niedersachsen ist die Ärztekammer des Bundeslandes Niedersachsen. Die Ärztekammer Niedersachsen (ÄKN) ist die Selbstverwaltungsorganisation der mehr als 40.000 Ärzte im Bundesland. ​Im Atriumhof des Büroneubaus sollten zwei Brunnen aus "Wasserwänden" montiert werden. Die einzelnen Granitblöcke und Platten hatten ein Gewicht zwischen 460 kg und 1400 kg. Besondere Probleme entstanden durch den schmalen Durchgang zum Atriumhof und durch die relativ geringe Bodenbelastbarkeit des Areals. Diese Beschränkungen haben den Einsatz eines Großgerätes von vornherein ausgeschlossen. Die Aufgabe war dagegen geradezu ideal für den Einsatz eines miniKRANs, Typ MAEDA MC 285, aus der Mietflotte des PartnerLIFT Mitgliedes ID Mietservice aus Hannover. Diese japanischen Minikrane werden von der Firma ID Mietservice aus Hannover in Deutschland vertrieben. Sie bestechen durch hohe Qualität und beste Leistungsdaten. Die Zeitplanung des Bauherren konnte dank des miniKRAN Einsatzes um ca. 30% unterschritten werden.